Brandeis National Committee: Community. Growth. Giving. Since its creation in 1948, the Brandeis National Committee has played a vital role in Brandeis’ aim to maintain academic excellence and to provide bright students with the resources to learn and grow. The Brandeis libraries act as a base for campus-wide academic endeavors by providing research materials, study spaces, subscription-based media, hosting the MakerLab, and tech support. Your support ensures the University can continue to provide, maintain, and expand its library resources for the benefit of its students, staff, and greater community. The benefits of continuing education are invaluable, but the finances involved can be prohibitive for some students. Brandeis is cognizant of this fact and, true to its core values, believes that the brightest minds shouldn’t be limited by an individual’s financial situation. Through the generosity of BNC members, Brandeis is able to provide scholarships to students every year. Donors like you make it possible for the next generation of thinkers, creators, and leaders to succeed and improve our world. The Book Fund supports the Brandeis Libraries book collection as well as cutting-edge research to be published in scholarly journals. A donation to the Book Fund is a wonderful, meaningful way to make a gift in someone’s name. For each gift, the recipient will receive a personalized tribute card or leatherette folio with a facsimile of the bookplate. What better way to celebrate, honor, or memorialize someone than to connect them to the hub of knowledge of a prestigious institution? Tribute cards and folios range from $10-$500. The Sustaining the Mind Fund supports scholarships in the sciences and scientific research into neuro-degenerative diseases. Diseases such as Alzheimer’s, Parkinson’s, and ALS are becoming increasingly common as people live longer, but we still don’t have a cure. With your support, the Brandeis minds of today can continue working to save millions of minds in the future. The Scholarship Campaign BNC ran for two years was so successful that it has now become a long-term fund. Brandeis’s commitment to give the brightest students equal access to higher education, regardless of financial situation, means scholarship assistance is a top priority. By supporting scholarships, you can help ensure the best and brightest students have the chance to pursue their dreams and improve our future. 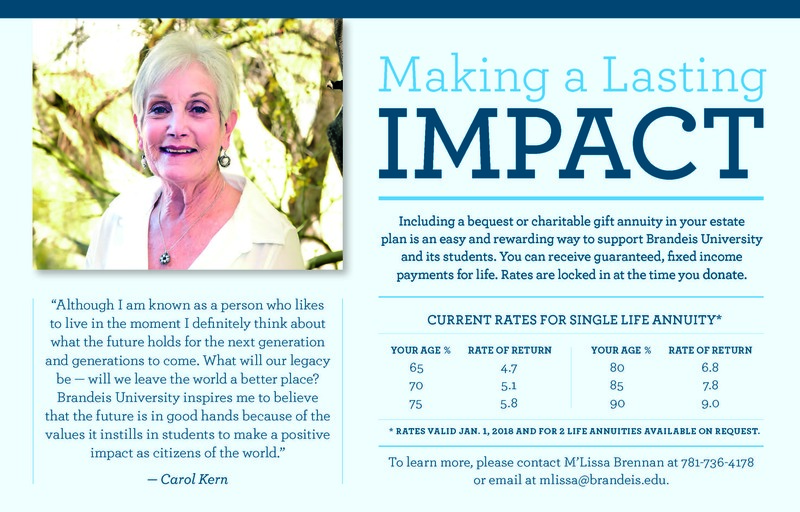 Plan ahead for how you will impact Brandeis University through Planned Giving. Your gift will help award scholarships to deserving students. 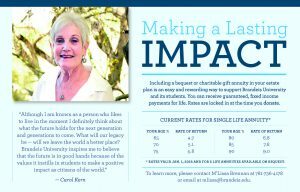 Planned Giving can come in several forms such as charitable gift annuities, bequests, deferred annuities, charitable remainder trusts, charitable lead trusts, and donor advised funds. To learn more about Planned Giving opportunities or to arraign a consulation, contact M’Lissa Brennan at BNC’s national office at 781-736-4178. Join a vibrant, intellectual community of lifelong learners in the biggest friends-of-a-library network in the world. Come to an open event to get to know the chapter! For more information visit our auxiliary site or email brandeisconejo@yahoo.com. Join or renew a membership online here. © 2019 All Rights Reserved, Conejo Valley Chapter of the Brandeis National Committee.